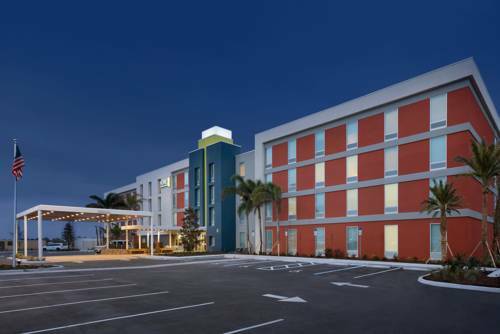 Home2 Suites by Hilton Orlando/International Drive South is situated next to the Orlando Premium Outlet Mall moments from popular restaurants and entertainment options. We are conveniently located for visits to all of Orlando*s theme parks including The Walt Disney World Resort Universal Orlando The Holy Land Experience and Gatorland. A free shuttle service to all parks is available and we are steps from the I-Ride Trolley stop. Enjoy easy access to major feeder roads such as I-4 417-Central Florida Greenway and the Florida Turnpike. We are also less than five miles from the Orange County Convention Center. Feel at home in a spacious suite at our extended-stay hotel on International Drive. The innovative Working Wall lets you change your space to fit your needs. Enjoy lots of storage space and amenities including a desk with ergonomic chair free WiFi a 42-inch TV and a fully-equipped kitchen. Don*t leave your pet at home while you travel - your furry friend is more than welcome at Home2. Start your day with free breakfast at our Inspired Table and buy snacks and sundries 24/7 at Home2 MKT. Swim in the outdoor pool or multitask in our integrated laundry/fitness facility Spin2Cycle where you can run a load of washing while you exercise. Charge your smartphone as you relax in the modern Oasis. After a busy day of shopping meetings or visiting theme parks unwind with friends around the cozy fire pit on the outdoor patio.